The U.S. Department of Housing and Urban Development (HUD) provides rental subsidies to families with low income in the form of Housing Choice Vouchers and Project Based Units. The Minneapolis Public Housing Authority (MPHA) administers the program in the City of Minneapolis. MPHA pays rent subsidies directly to rental property owners on behalf of eligible individuals and families. The intent of the HCV Program is to lessen the burden on the family’s budget for housing costs, allowing them greater choice in selecting a rental unit. The Section 8 HCV Programs offers financial assistance for rental housing to eligible low income individuals and families. 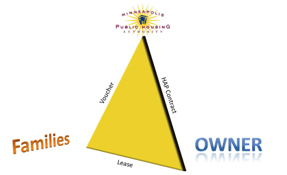 The rental assistance provides rental opportunities to low income families by partnering with property owners of private market rental housing in the City of Minneapolis. The rental assistance provides program participants with the ability locate and rent any type of housing, in any area of the City. There are several unique programs within MPHA’s Section 8 HCV Program which expand the opportunity to receive tenant based rental assistance. MPHA’s Mobility Voucher Program requires participant families to move to communities of greater opportunity within Minneapolis and the 7 County Metro Area. The program is structured to increase housing choices for families who are on MPHA’s Section 8 HCV waiting list who currently live in areas concentrated by poverty and who are willing and able to move to communities of greater opportunity. The HCV Program continues to encourage all families to locate and obtain housing in communities of greater opportunity. Eligibility criteria for the Mobility Voucher Program is as follows: applicants must be currently living in a Minneapolis area impacted by race and poverty, have minor children, be employed, in job training or in school, and be willing to enter into a contract and relocate to an area not impacted by poverty, for a minimum of three years. The Mobility Community Services Coordinator will provide the Mobility families with case management services, referrals to community resources and employment / educational opportunities, as well as act as the liaison between the tenant family and the property owner. Working closely with the Community Services Coordinator-Mobility, families set goals, attend regular meetings, participate in workshops, and receive on-going case management throughout the entire time they are on program in order to achieve a greater level of self-sufficiency for their entire family. The HUD-VASH Program is a collaborative effort between the US Dept of Housing and Urban Development and the Veterans Affairs Department. It’s a national initiative that provides permanent housing and supportive services to homeless veterans. The goal of the Program is to combine Section 8 rental assistance vouchers with case management and clinical services provided by the Veterans Affairs Department at its medical centers to enable homeless veterans to re-integrate in the community to lead healthy, productive lives. The Minneapolis Veterans Administration will screen homeless veterans for eligibility for the HUD-VASH Program, in accordance with its screening criteria. Eligible homeless veterans that agree to participate in case management will be referred to MPHA for voucher issuance. Hennepin County will screen eligible applicants for the F.U.P. Program, in accordance with its screening criteria. Eligible applicants that agree to participate in case management will be referred to MPHA for voucher issuance. Families are required to participate in case management for 6 months after the family has received rental assistance. F.U.P. Youth are required to participate in case management for the duration of 18 months of rental assistance.